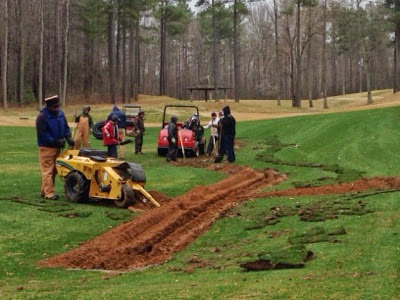 The first part of 8 fairway drains slow plus it needs some additional drains to help move a lot of the water that drains off the slopes from both sides of the fairway. 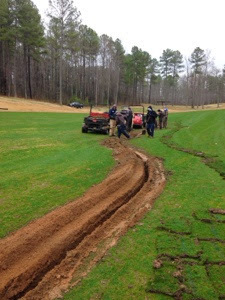 Several trenches have been plowed to a depth of 12-15 inches. Pipe with small holes in it is sandwiched between two gravel layers inside the trench. 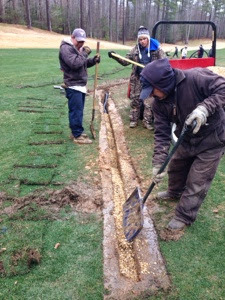 This will help move water down and into the pipe to allow for faster drying time. 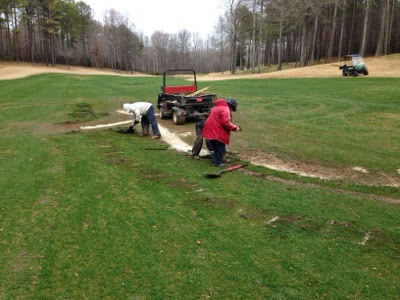 Sod was cut off before the work was performed and will be replaced once the work has been completed. Here you can see the staff adding the top layer of gravel of the pipe. 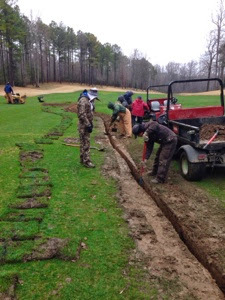 Adding the sod back to the trench line.